On Saturday, July 21, at 12:30 pm, New England Wildlife Center will celebrate the Andrea McKenna Harris Nature Trail! The celebration begins at 12:30 pm with a rededication ceremony to honor the memory of Andrea McKenna Harris, a steadfast advocate for New England Wildlife Center, and the continued support of her husband Roy Harris. Following the ceremony, New England Wildlife Center’s CEO, The Odd Pet Vet, and noted naturalist Dr. Greg Mertz will give a guided “Science of Summer” nature walk. He will share his vast knowledge of local habitats, trees, plants, and animals to help nature-lovers of all ages understand and identify what they see, hear, and smell in the forest at this time of year. The guided tour is approximately 60 minutes. This is a FREE EVENT open to nature-lovers in our community. Space is limited to 20 and registration is required. Please email Erica Burrows, education and outreach coordinator, at erica.burrows@newildlife.org to reserve your spot. What Is The Andrea McKenna Harris Nature Trail? 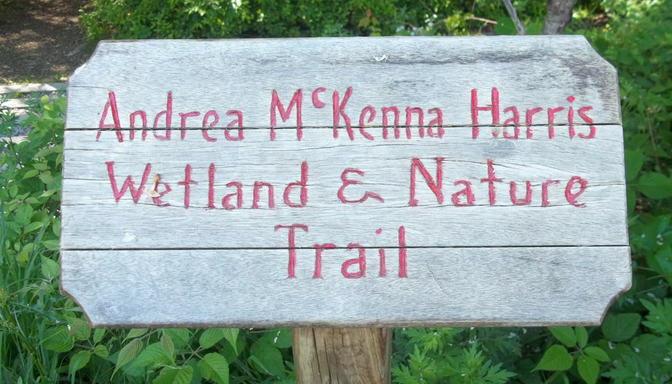 Located on the grounds of NEWC at 500 Columbian Street in South Weymouth, the Andrea McKenna Harris Nature Trail winds through the wetlands and uplands of the Center’s woodland. The trail passes over and around a vernal pond that extends for more than two acres. It’s approximately 4/10th of a mile and connects into trails that pass through conservation areas in the towns of Weymouth, Braintree, and Randolph. The trail is open 10 am – 4 pm, 7 days a week, and is also the setting for NEWC’s annual Night Of A Thousand Faces Halloween fundraising event. The winter storms brought down branches, trail markers, and other debris across the trail. The wet spring delayed regular trail maintenance as well. As the weather has warmed, NEWC staff, volunteers, and inmates participating in NEWC’s pre-release job training program have been working on clearing the trails, and soon will add new trail markers and updated signs. After his wife passed away, Roy Harris decided to honor her love of nature with a gift to NEWC to maintain the nature trail. Andrea was an avid naturalist and taught her two sons Dave and RJ and their many friends to respect and enjoy nature. NEWC is grateful to help others experience nature and connect with each other as they take in the sights, sounds, and smells of the forest walking along the Andrea McKenna Harris Nature Trail. READY TO REGISTER? Email erica.burrows@newildlife.org now to reserve your space on the “Science of Summer” nature walk!